The reason we pay for the newest tech and entertainment innovations is because we want to have the latest and most up to date products on the market. They have more features, perform better and they’re just plain cool. There is nothing wrong with wanting to be ahead of the game. The problem with having state of the art equipment and products is that finding quality help to repair your favorite tech toys can be difficult. But lucky for all New Orleans residents, Wisp on the West Bank is here to help with your all repair needs! Our experience ranges from computers, laptops, tablets, smartphones, and gaming consoles. We have seen it all and know that sometimes you don’t always know what is happening with your tech gadgets. That is why we offer a free diagnostic exam for all your devices. Even if we cannot fix your problem, we can help you find a solution and quality repair because we believe in building a trusting and helpful relationship with our clients. If you haven’t heard yet, Wisp should be your new West Bank computer repair shop. We offer affordable pricing for much needed repairs that can save you from having to buy a new device. We are located conveniently on Manhattan Boulevard in Harvey, only a quick 10 minute drive from downtown New Orleans! 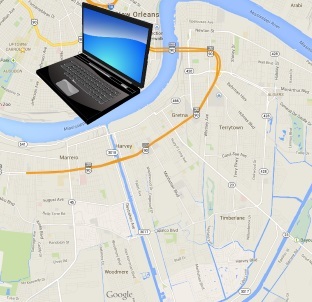 Don’t let the bridge scare you away from quality and affordable West Bank computer repair. Our computer repair services range from a complete virus and malware removal for only $95 (including installation of the latest and best antivirus software), to hardware installation all for under $100, file restoration for $35 and a entire PC build for $60. You just can’t beat these prices. So if you are looking for quality and trustworthy computer repair on the West Bank of New Orleans, you have found it at Wisp. Come in and see us at 1901 Manhattan Boulevard, suite F-105, Monday through Saturday 10AM-7PM or you can call our office with questions at 504-309-5322.